Wow! You can now activate 20% data bonus on your MTN line for free, when activated, you will be getting free 20% of any data you purchased - just like the 100% data bonus. This offer is only available to all MTN users, if only you activate it yourself. There are some people that have been finding it difficult to activate the MTN 100% data bonus and finally, the 20% data bonus should be your alternative. To get data doubled, you should only purchase data from the applicable data plans from MTN. So let's go on. If you don't receive the message automatically, you would Tweak your IMEI to activate the data bonus. Then, you will receive a successful message from MTN within a period of time or instantly, saying; "Congratulations! 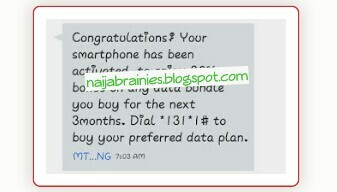 Your smartphone has been activated to enjoy 20% bonus on any data you buy for the next 3months.". Now, dial *131*1# and buy any data plan from the weekly, monthly and daily plans to get it doubled instantly and check your data balance by dialling *559#. With this, your data will always be doubled till 3 months and it's better. In 100% data Bonus, you would get 500naira for 2GB doubled but in 20% data bonus, you would get 500naira for 1.5GB, if possible.